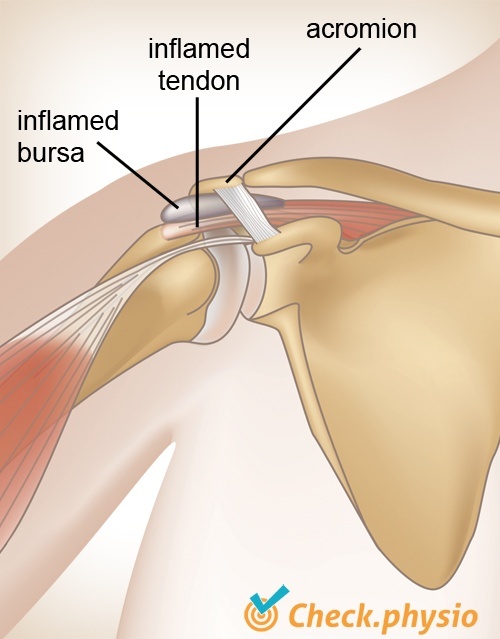 In the case of impingement syndrome, tissue that is located beneath the roof of the shoulder becomes impinged between the head of the humerus and the shoulder roof. The pain that occurs is felt primarily when elevating the arm. The word "impingement" is a confusing term. The literal definition is "collision", but in the case of impingement syndrome it usually means "trapping". The shoulder joint consists of structures such as the shoulder blade and the upper arm bone (the humerus). The roof of the shoulder is formed from the shoulder blade and consists of the acromion, the coracoacromial ligament and the coracoid process. 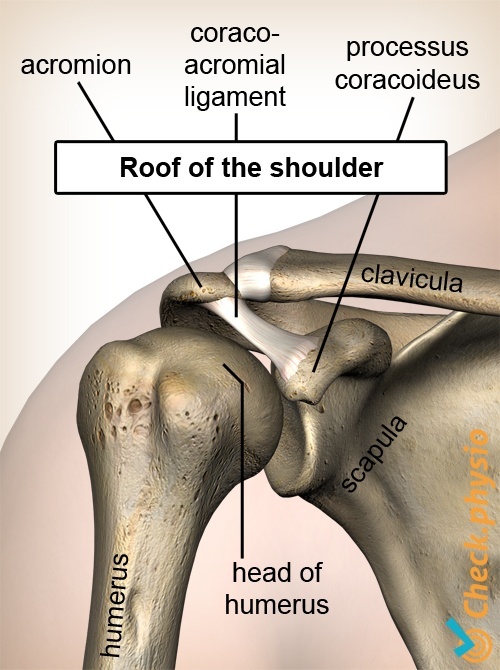 The roof of the shoulder is located above the head of the humerus. There are muscles, tendons and bursae located between the roof of the shoulder and the head of the humerus. In the case of impingement syndrome, one or more of these structures become trapped because the head of the humerus moves too far upward against the roof of the shoulder. There are various causes. Firstly, the impingement can be caused by certain structures under the roof of the shoulder swelling or taking up extra space. This results in impingement more rapidly when the upper arm is elevated. A second cause is that the space under the roof of the shoulder becomes smaller because the humerus moves too far up. This can be caused, for example, by incorrect functioning of the "rotator cuff" muscles in the shoulder. The roof of the shoulder can also have an unfavourable shape, making the space below (the subacromial space) smaller and thus leading to more rapid impingement. As impingement syndrome can have various causes, the symptoms can differ for each patient. Typical characteristics are pain on the outside of the shoulder, sometimes radiating to the upper arm and in severe cases to the hand. The pain occurs when elevating the arm. 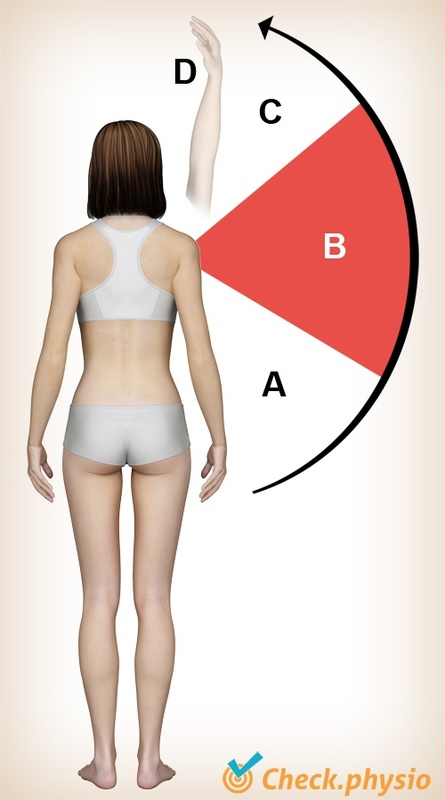 This is often felt in the range of movement around 90 degrees (see image, movement range B). The end of the movement can also be painful. In addition, the patient experiences pain during rotational movements of the upper arm and when elevating the upper arm against resistance. The treatment is aimed at reducing the pain and improving the mobility and muscle function. The aim is to increase the subacromial space and thus relieve pressure on the affected structures. Training the rotator cuff muscles can play an important role in this process. In addition, stretching exercises can be used to normalise the muscle length of shortened muscle tissue. If (acute) severe pain is the main problem, the GP or specialist can decide to administer a corticosteroid injection (anti-inflammatories). Depending on the nature and the aim of the treatment, the physiotherapeutic treatment is expected to have an effect on the pain and/or the mobility within 3 to 6 weeks. Surgical intervention can be considered if this is not the case, an injection does not provide relief and the symptoms are severe. Hyvönen, P. (2003). On the pathogenesis of shoulder impingement syndrome. Oulu: University Press. Jansen, M.J., Brooijmans, F., Geraets, J.J.X.R., Lenssen, A.F., Ottenheijm, R.P.G., Penning, L.I.F. & Bie, R.A. de (2011). KNGF Evidence Statement. Subacromiale klachten. Supplement bij het Nederlands Tijdschrift voor Fysiotherapie. Jaargang 121, nr. 1.